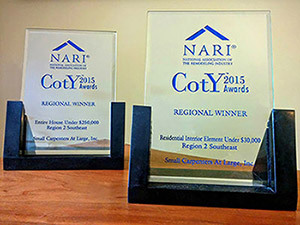 Small Carpenters at Large has received numerous local, regional and national awards for design, craftsmanship, customer satisfaction, employee satisfaction, and business achievement. Attention to detail is a hallmark of quality, whether in a relationship, a service, an art or a craft. 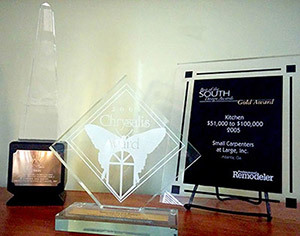 Our belief that remodeling comprises all of these principles may be why Small Carpenters at Large is a consistent winner of awards, including “Contractor of the Year.” We believe high-quality, award-winning attention should characterize any custom remodeling work, and it does if it bears the name Small Carpenters at Large. What is most important to us is to win your recommendation. Our National Customer Satisfaction Award is a testament to our commitment to superior customer service, and shows that we met or exceeded the expectations of our customers. According to our customers, the areas where our company really stands apart from other remodeling companies are: communication throughout the project, adherence to the construction schedule, timeliness of response, cleanliness of jobsite and attention to detail. We believe that communication is the key to all successful relationships. Our team approach allows you to work closely with our staff to satisfy your remodeling goals. See below for a complete listing of awards Small Carpenters at Large has received.